Bus Éireann, in conjunction with the National Transport Authority are pleased to announce the introduction of an enhanced Waterford City Service on Sunday, 9 December 2018. This enhanced network will be delivered by a fleet of 17 new state-of-the-art city buses. 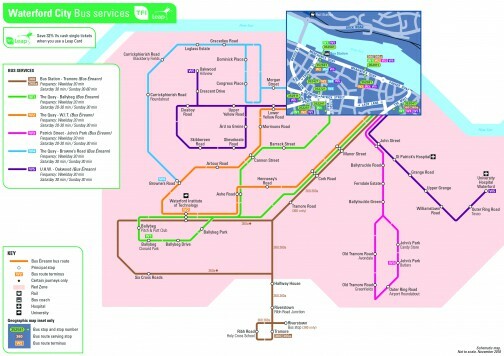 All vehicles, which will be fully accessible and in the Transport For Ireland livery, will operate the five city routes in Waterford (now numbered W1 – W5). Customers will experience many benefits from this new timetable including – for the first time in the city - a full Sunday schedule, later evening services as well as increased frequency on some routes. All 17 vehicles will feature a bright new interior design, comfortable seating, a dedicated wheelchair space, a separate designated child buggy space, priority seats, USB sockets, complimentary WiFi, CCTV security cameras and customer information screens. In addition to the changes highlighted above, Route W1 & W2 combined will now provide a service every 10mins to Waterford Institute of Technology throughout the day, with a combined 20min frequency during the evening. Increased frequency from every 40mins to every 30mins. Extended to Brown’s Road to serve both the IDA Industrial Estate and Waterford Institute of Technology. New Sunday & Public Holiday timetable. In addition to the service improvements above, over the next eight weeks new bus stop infrastructure with stop specific information will be installed at all stops across Waterford City. This new infrastructure will further enhance the customer experience. The new timetable will be supported by additional driving and supervisory staff, creating 17 new jobs. If you have any feedback in relation to the revised service offering please forward your comments to customercare@buseireann.ie. Bus Éireann would like to thank our customers for their continued support of the public transport network in Waterford and we look forward to welcoming you on board our new buses in the near future. The service enhancements on Routes W1 to W5 that will be introduced on Sunday, 9 December 2018 have been approved by the National Transport Authority.